The bodies of skin divers are washing up on the beach and two federal agents are on the case. They discover a radioactive rock out in the deep water, they also discover a horrifying sea monster that seems to be guarding it. The man behind the strange rock is a local Professor who is being manipulated by a gangster. It's 1955 so you can bet the Commies have something to do with this too. Walking into The Phantom from 10,000 Leagues thinking it's going to be about the titular creature is a mistake. The monster itself is merely a side note to the machinations of a mad scientist. A film called Middle-aged Phantom of the Beach House probably wouldn't have sold nearly as many tickets. 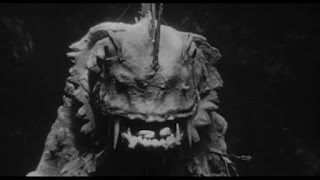 Take a film like Horror of Party Beach (1964), as ridiculous as its monsters look, they are used well. This is done by saving them for key moments of horror. By comparison, the Phantom just lazes around in the water attacking the occasional diver. Although the design has a little life to it, there's just nothing very dynamic about this monster and when he's the main draw for your film that's big trouble. 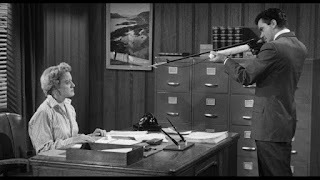 "Hey buddy, I'm pretty sure this falls under harassment in the workplace." With the monster dead in the water (so to speak), that leaves the human actors to try and salvage the movie and here we've got problems too. No one is particularly likeable or even very interesting. Professor King (Michael Whalen) is ostensibly the most interesting character because he is a conflicted antagonist. He's just not very likeable and his motives are never made entirely clear. Dr. Ted Baxter (Kent Taylor) is a pushy investigating scientist who is too bland to be likeable. That leaves us with Ethel (Vivi Janiss), who is the professors' secretary. She knows something is up and has to make the decision about what to do, despite threat and intimation. She has an actual character arc, so of course she given very little screen time. There are a few (very few) decent moments to come out of the movie. One of the best is when Professor King's assistant idly wields a harpoon gun in the presence of Ethel. He delivers a simple understated moment of threat and it works quite well. Late in the film there is a scene where everyone watches helplessly as a ship out at sea crosses the beam of radiation and explodes. This moment of tension and futility feels more alive than virtually the rest of the entire film. The film needed to trade on more horror to hold up its limp espionage story. Creature features often come across two major problems. They don't show the creature enough, instead relying on the human element to carry the film, or they show it too much and often spoil the illusion by allowing the viewer time to inspect the often cheaply made monster costume. 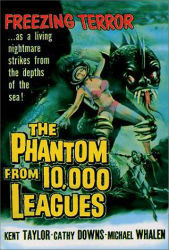 The Phantom from 10,000 Leagues somehow manages to do both of these by forcing its tale of mad scientists and g-men to drag on far too along, and then letting the camera linger on a less than convincing underwater monster costume. Recommended for only the most undemanding rubber monster suit enthusiasts.